There’s a new link for a free Home Made Simple coupon booklet. If you’ve signed up in the past, it should allow you to sign up again. I think this offer comes a long every few months. This is a great coupon book. I was surprised how many I used, and how many items I was able to get for free with other offers. 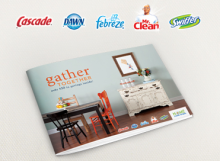 This coupon booklet contains over $30 in coupons for P&G products.